IELTS is a straight forward English test. At First Academy, we encourage you to take training only if you need it. To this end, we offer every candidate a chance to take a free test. The test will be evaluated. This will give you a clear idea of where you stand and if you need coaching in the first place. IELTS Training by Qualified, experienced and Professional IELTS trainer to the candidates who wish to pursue their higher studies in abroad through Career Bridge Group Consultant. With more than 15 years of experience coaching for the SAT®, GRE®, IELTS® and other standardized tests, we are second to none when it comes to preparing you for your test. 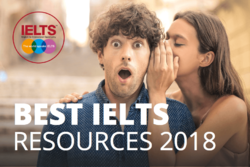 IELTS is designed to evaluate the language proficiency of candidates (Non-native speakers) who aspire to study or work in English speaking countries. It is the world’s proven English test. Over 1.4 million candidates take the test each year to start their journeys into international education and employment. Periscope offers excellent coaching and guidance for students in preparing for IELTS/TOEFL exams. To train candidates who are sitting for the IELTS, to score higher bands. A person who enrols for this course must be reasonably good in English. If his or her English is poor, it is recommended that he or she first enrol for Fluent English programme. It is a 3 month training program which includes daily practice over the course period of each skill set along with insights and tips to help answer specific question type.